The Northwest is always a favorite place for thousands of people to visit. Landscape paintings here are also like the fairyland in the human space. Ô Quy Hồ Pass (also known as Hoàng Liên Pass) is considered an arduous trail that brings a hefty challenge for many backpackers. Laid on the 4D highway that crosses Hoàng Liên Sơn Mount, the pass connects both Lào Cai and Lai Châu provinces with its top, creating a slight boundary in between. The name “Ô Quy Hồ” originates from the agonized cry of a bird. The pass lies 2,073-metes above sea level and can grow to the length of almost 50 kilometers. It’s the altitude, the ruggedness, and the length of Ô Quy Hồ Pass that gives itself the name “King Of The Northwestern Pass”. With a deep abyss to one side and sheer cliff on the other, Ô Quy Hồ is a tough challenge to all those that cross it. And yet, while dangerous, the experience can be quite relaxing. When crossing Ô Quy Hồ pass, lingering clouds around mountains bring tourists a feeling that helps them forget the chaos in their lives. Mã Pì Lèng – or Ma Pi Leng Pass - is considered one of the most perilous, yet stunning, passes from the mountainous Leng Pass - is considered as one of the most perilous, yet stunning, passes from the mountainous North. Often, this pass is regarded as The Great Wall of Vietnam or Meo’s Pyramid. 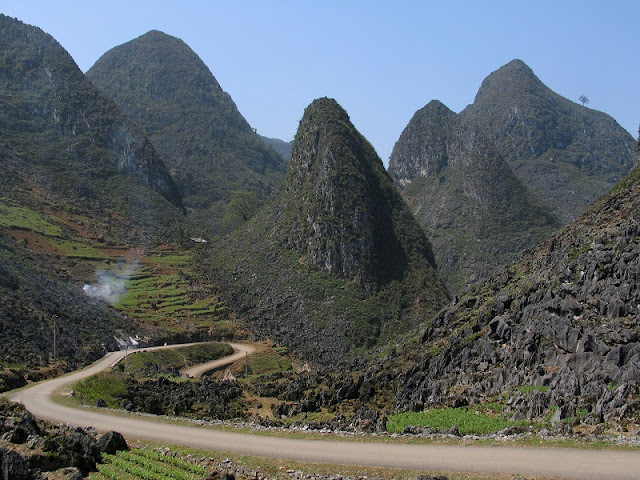 Mã Pì Lèng (sporting different pronunciations like Mã Pí Lèng, Mã Pỉ Lèng) belongs to Hà Giang Province, which covers roughly 20 kilometers over the Mã Pì Lèng Mount– a 1,200-meter high mount from Đồng Văn plateau. It runs along the Road Of Happiness, connecting Hà Giang City, Đồng Văn and Mèo Vạc Town. The pass is described as a thread hanging between mountains, creating spectacular views of rocky plateau. It was created in 6 years (1959-1965) by thousands of youth volunteers from 8 Northern provinces. The youth were quite courageous as they were frequently forced to hang on the mountain’s edges for months at a time. Mã Pí Lèng can be directly translated as “the horse’s nasal bridge”, the figurative meaning is concerning the danger of mountain tops as horses often lose their breath when reaching its peak. People who’ve climbed to the top of Mã Pí Lèng to view the greeny Nho Quế river note that they’ve been lost in a fairyland filled with ease and comfort. Pha Din Pass maintains an important and heroic part in our history. 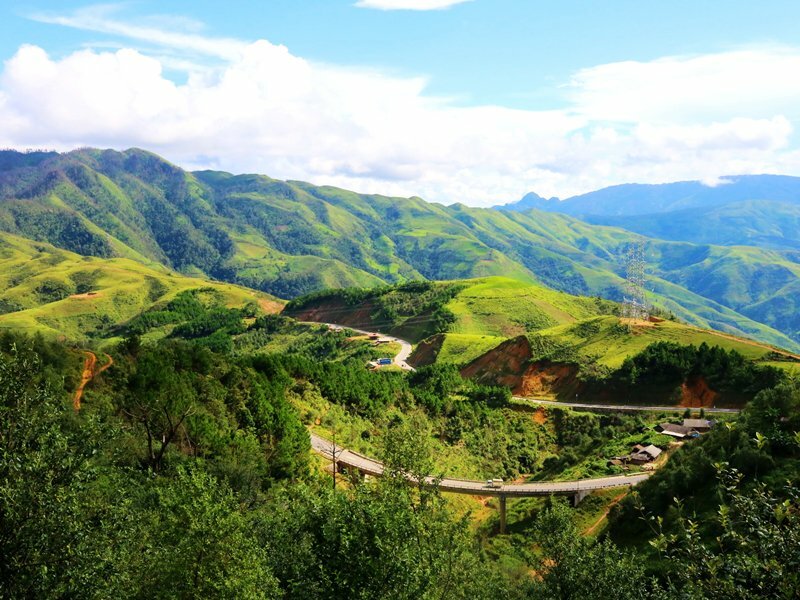 Laid on Highway 6 that crosses northwestern provinces, Pha Din stretches 32 kilometrers and is considered one of the 6 most impressive passes in Vietnam. From 360th to 392nd km on Highway 6, Pha Din connects both Son La and Dien Bien provinces, which belong to Tả Phìn Tây Plateau System. The peak of the pass is at an elevation of 1,648 km above sea level. (Interestingly, there is a huge TV tower weighed approximately 70 tons, possessing the wind of 200km/h.) The pass is full of serpentine twists and turns, with a deep abyss to one side and sheer cliff on the other. The Pha Din pass is covered by lingering clouds and at its foot there lies villages of ethnic minority groups. Under the steep gorge mountain pass from Dien Bien province is where Muong Quai valley’s laid, dressed with the mount’s lush green. Close to the top of the pass, however, villages are hardly ever seen. Instead, it is only deep blue sky and majestic mountains all blending together to create perilous, yet stunning views. Running through Khau Pha mountain peak, which is considered one of the highest mount in Mu Cang Chai, Khau Pha Pass has been deemed one of the most winding and steep pass in Vietnam. 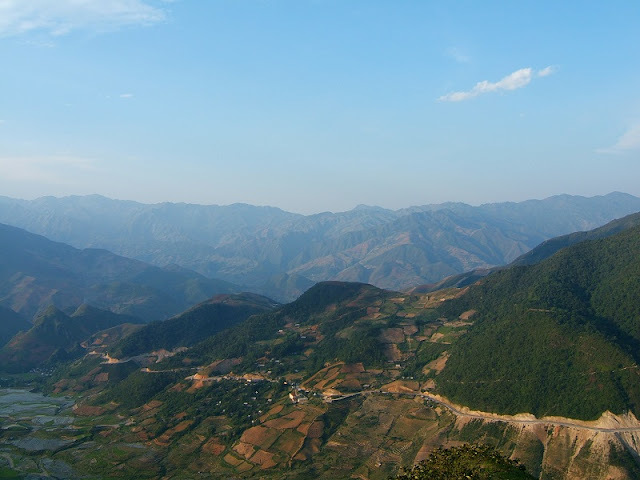 The pass grows to the length of 30 kilometers, connecting both Van Chan and Mu Cang Chai districts in Yen Bai province. In Thai ethnic minority language, “Khau Pha” can be directly translated as “The mountainous horn protruding the blue sky” as a result of the way the mist and fog make the mountain top rise appear above the puffy white clouds. Along the length of Khau Pha are dozens of sharp bends, bumps, and cobblestones. On cloudy days, the pass is extremely dangerous for drivers because there are no barriers or warning signs. The view is the most amazing in September and October due to endless terraced slopes and terraced rice fields that are beautifully colored yellow. This is the best time to visit Khau Pha Pass and admire the breathtaking scenery.